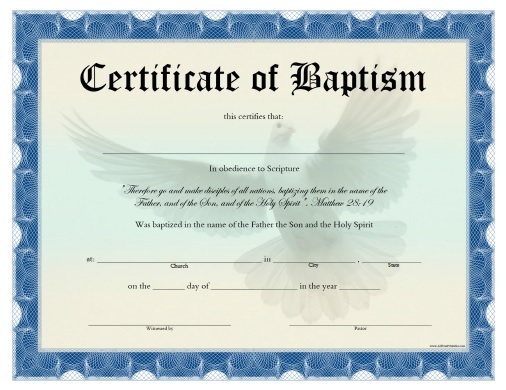 Free Printable Certificate of Baptism. Free Printable Certificate of Baptism, for the new member of the church. A very useful free certificate for the church that needs a quick, free certificate to save some time and money. Includes a beautiful dove background and blue frame with Matthew 28:19 Bible verse. Print this beautiful Certificate of Baptism free using your laser or inkjet printer with best quality settings and quality certificate paper, and present this gift to the person that has born again. The PDF certificate includes form fields to make easy to write directly in the PDF. Just write the name, church, city, state, date and Pastor and witness signatures. Click the link to download or print the Certificate of Baptism free in PDF format. Excellent Service . . . Thank you for making these Certificates available. May I suggest Certificates for: Vacation Bible School (VBS) and Sunday Class Promotion. Thank you for your wonderful services. Considering Baptismal Certificates, there are within the Christian faith two distinct schools of thought, the first based upon Matt 28, which you provide a certificate for, and the other based upon the Book of Acts, “in the Name of Jesus” which I did not see. May I suggest providing one for both perspectives. If I missed the one I was looking for, please contact me with a link to it. Thanks you for your time.